Let me tell you about my friend, Robyn. She’s gorgeous, brilliant, talented, kind, warm-hearted, and has a seriously adorable family. Robyn is good people, people. All that’s impressive enough, right? Well, the woman can cook, too. She posted the most incredible looking Balsamic Roast Beef recipe a few of weeks ago and I about fell out of my chair it sounded so good. In fact, her recipe is on that short list of ones that have sounded so darned good that I had to make it the minute I read it. Literally. As in, I stood up, unplugged my laptop and moved to the kitchen to begin making it AS I was reading it. I made that roast twice in one week. …Then the third time I started making it (Yes, three time in two weeks. What?!? Me? Obsess much?) I realized I was out of a couple of ingredients. I preserved Robyn‘s method and played around with the stuff I always have handy. In this house, that usually means going Asian directions with recipes. The result was fah-hah-haaabulous. Yeah, so. The point is that it’s not just good, it’s great. If you have more willpower than I do, or start with a larger roast than I did, leftovers store and freeze, and reheat beautifully. 1-2 tablespoons Asian Chili-Garlic Sauce depending on heat preference. 4-6 cloves garlic peeled and lightly smashed with the side of a knife, depending on how garlicky you like things. Place the beef roast in the crock of a slow-cooker. Scatter the ginger and garlic cloves over and around the beef. Stir together the broth, balsamic vinegar, 1/4 cup of the honey, the soy and fish sauces, and the chili garlic sauce and pour over the beef roast. Cover and cook on HIGH for 4 hours, or LOW for 6-8 hours or until the beef is fork tender. Carefully transfer the beef to a casserole dish or a large bowl. Pour the juices from the slow cooker into a small saucepan with the remaining 2 tablespoons of honey and bring to a boil over high heat. You can reduce by as much as 3/4, just keep in mind the flavours will intensify the more you reduce it. While that is boiling, use two forks to shred the beef as finely as you wish. You may pour the reduced pan juices directly over the beef or serve as a sauce to be used at the table. 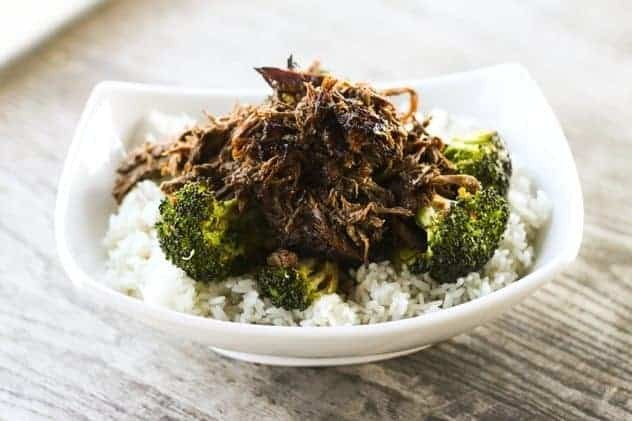 We like to pour it directly over the beef, toss it, and serve over Spicy Asian Broccoli and hot rice. Put leftover meat and pan juices in a freezer-safe bag. Squeeze as much air out of the bag as you can before sealing and freeze flat. To reheat, empty the contents of a bag into a microwave or oven safe dish. Heat covered (by plastic in the microwave or foil in the oven) at a moderate temperature (75% in the microwave or 350°F in the oven) just until heated through. I’m so glad your family loves this balsamic roast beef as much as mine does! We can’t get enough of it! My addiction to fish sauce has reached 12-step levels. Yum. Can you do this in a regular oven with a large Le Creuset Dutch Oven? No room for a slow cooker. Wondrin…. LOVE this recipe!!! We almost always head in the Asian direction in our house too. I like the flavors in this – tender, spicy shreds of beef. I want to stick it all in a great egg roll. This would be my husbands favorite dinner I’m sure! Thanks for the recipe!! Wow! We too go with an asian flair whenever I’ve not planned something out. This looks and sounds delicious. I”m assembling the ingredients now! Thanks for sharing your recipe. The pictures in this blog entry looks so yummy it made me SO hungry. I’ve never had a slow-cooker but I make due with my dutch oven and stove…I love trying new flavor combinations with these roasts. They are inexpensive and you can use them in so many ways. Today I marinaded a bottom round in Tandoori Masala spices to cut up and use in multiple dishes I’m planning. I’ll have to try this Asian-spiced one next! Is the beef/chicken broth part of the sauce prior or cooking? Made this over the weekend and LOVED it. Super easy and flavorful – thanks! I just got a bunch of venison roasts and I bet this would be fabulous with it! This was a huge hit with my family! 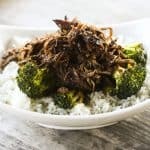 We loved the flavors and the spicy broccoli dish is a MUST to be added on top of the meat! I added some mushrooms to the broccoli before roasting and the whole dish was fabulous! Next time I’ll double everything for leftovers…there were NONE after my guys finished eating! Thanks for sharing! Yum-O! Its going in my crockpot in the morning. Can’t wait! Will sirloin tip steaks that I need to use up work in this? I think it likely it will work fine! Of course, it is a different cut of beef with different characteristics, so it will be different but I still think it will be tasty. Sounds divine! Can u please tell me how much beef in kilos? So I made collard wraps with this beef, plain rice, and pickled watermelon radishes. They were SO DELICIOUS. Thank you so much for sharing! I did sprinkle a little bit of cornstarch into the sauce to make it thicker. But yeah. Definitely saving this recipe!